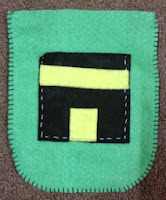 Use these crafts as activities when teaching about the Hajj. 2. Sa'i: Running between the mountains of Marwa and Safa. Make a torn paper mountain craft. Using brown paper, tear out 2 bumps for the mountains of Marwa and Safa and glue this onto blue paper. 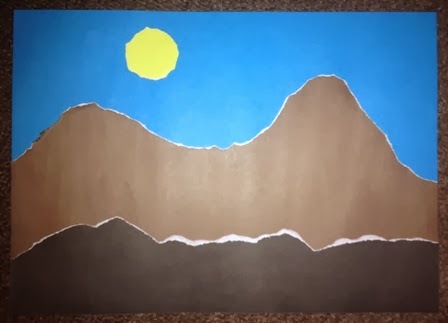 Next, use grey or black paper and tear out little bumps for the dirt ground and glue this on top of the brown mountains. 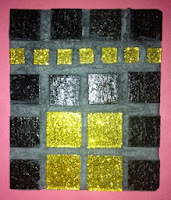 Then tear out a yellow sun and glue this onto the blue area. 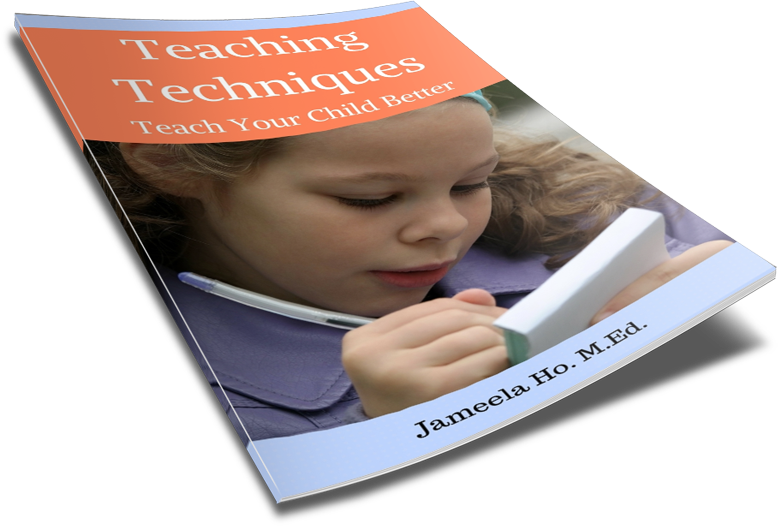 Mount onto black or grey cardstock. 3. Zamzam: Drinking zamzam water. 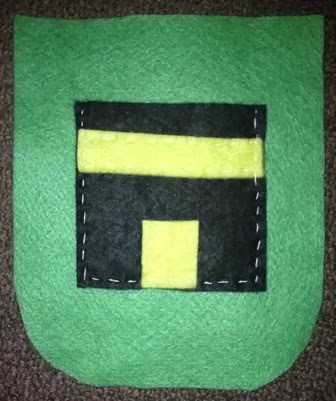 Sew a water bottle holder. It'll be similar to the small bag below but just make it narrower and the straps longer. Here's one that I crochet for my son. 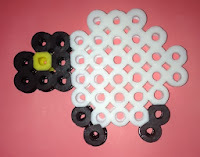 It's quite easy and quick to do, if your child is into crochet. 4. Stoning the Jamrah: Throwing stones at the pillars representing shaytan. Sew a small bag to hold the stones (or anything else). 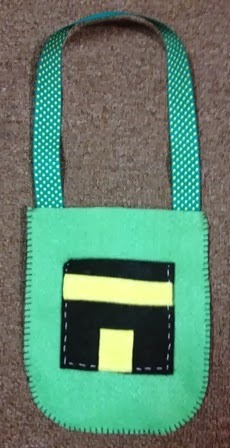 This bag is 15 cm x 18 cm. So it is small to hold small pebbles/items. 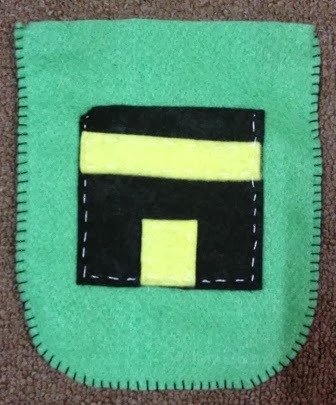 d) Lay the 2 green pieces on top of each other and use a blanket stitch to sew along the sides and bottom. 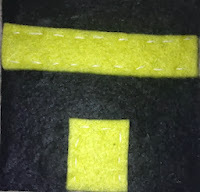 e) Sew the length of ribbon onto the top of the bottom green felt piece. My son said that he wasn't going to carry this because it looked like a handbag. So for boys, you could use a longer length of ribbon so that they could carry the bag across their shoulders. My son then said that he would carry it like that! Alternatively, your children could hang this up on a hook or doorknob and use it to store things. 5. Arafat: Supplicating at Arafat. I cannot think of a craft for this! Any ideas? Tasbih beads? 6. Qurban: Sacrificial slaughter of animal to be eaten and given to the poor. Make a melted bead sheep decoration. Design your sheep (or camel, goat, cow). When you're happy with the design, iron to set it. Loop a string through one of the holes and hang it somewhere - bag, door etc. 7. Eid ul Adha: Celebration of Hajj. 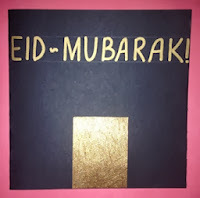 Make a Ka'bah Eid card. 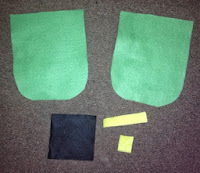 Using black cardstock, fold it in half. 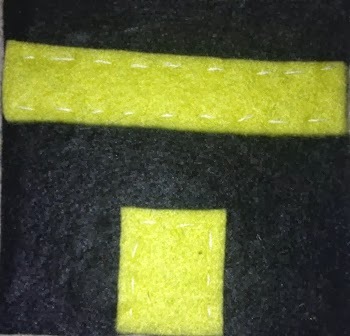 Then cut it so that it is a square. 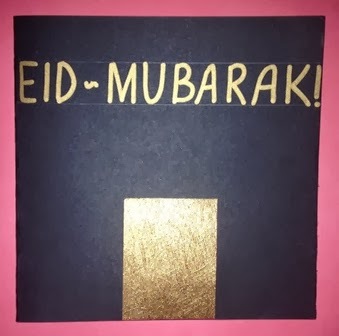 Write the words 'Eid Mubarak' (Happy Eid) with a gold marker across the top front of the card. 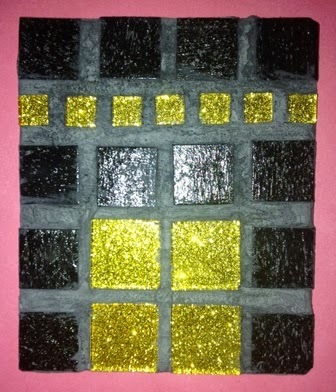 Cut out a rectangle for the door from gold paper and glue this onto the card. Use a gold pen to write a message inside. Assalaamu Alaikum sis! Jazakillahu khairan for sharing your ideas! Wa alakum salam. Wa iyakum! Thanks for the comment.